Every backyard should be a getaway, a place for you to escape from the pressures of life. You backyard should help you maximise the entirety of your property, not just the interior. It should extend your living space, and bring the outside world inside. So, here are 10 easy ways to turn your outdoor area into a picture-perfect getaway. For some reason, those slats of wood or composite just transport us to a different world. No matter how big or small your backyard is, you can use a deck to completely transform it. With some beautiful hardwood or some hardy and economical composite, you can create a square, circle or multi-level deck that can be everything from a dining space, to an outdoor bar and even the surrounds for a pool. Every backyard should have a deck, so it’s the first place to start on your getaway-creation journey. Unfortunately, Melbourne doesn’t enjoy paradisiacal weather all-year-round. That means you need to add some elements that will allow you to enjoy your getaway even when the weather isn’t cooperating. A patio or a gazebo is a great way to do this. They can be erected quickly, and they can become the site for so much. Run some creepers around them for the ultimate getaway look. Outdoor kitchens are an impressive design feature and an essential part of creating an oasis in your backyard. There’s nothing like cooking and dining outside on a balmy night. Add a sink and bench area to your BBQ, and you’ve got a veritable kitchen where you can prepare, cook and clean-up with a minimum of fuss. We guarantee you’ll use this facility all-year-round, especially when it comes to cooking seafood, steak and other foods that can leave your house smelling like your last meal for days. A getaway isn’t a getaway if it doesn’t seal you off from all your troubles. You can use a combination of fences, screens and garden walls to give yourself privacy in the most stylish way possible. Whatever method you use, you should definitely cover it in greenery. Plants are proven to have a calming effect, and the more plants you have, the better your air quality is. With intelligent planning, you can control light and shade within your backyard oasis. You can invest in mature trees or umbrellas, or if you want a permanent and fuss-free option why not build a shade sail. They’re cheap, and they provide the perfect amount of dappled sun to grow all sorts of tropical plants to make your backyard getaway as authentic as possible. You need to pay as much attention to furnishing your outdoor area as you would your interior. That means investing in quality furniture that is destined to withstand the rigours of an outdoor area environment. Go for quality hardwood, weatherproof fabric, wrought or cast aluminium and even plastics. With the right choices, you’ll spend as much time relaxing outside as you do inside. There’s no point in going through the effort and expense of creating a backyard getaway if you can only enjoy it while the sun is up. Even simple outdoor lighting can turn your backyard into a high-end piece of landscaping that will be the setting of long nights, early mornings and plenty of good times. Lighting also doubles as a design feature. The play of light can highlight important features and create a constant element of visual interest. You’ll never regret adding a bit of luxury to your getaway. Think about your favourite holiday spots, and how they created that feeling of luxurious relaxation. You’ll quickly find of yourself thinking of the various amenities. Maybe it was the firepit you enjoyed a glass of wine around, maybe it was the fireplace you cooked pizza in or maybe it was the water feature you fell asleep next to? You can enjoy all those things in the comfort of your own backyard, and bring the luxury to your back step. Whatever element you choose don’t be afraid to go all out. 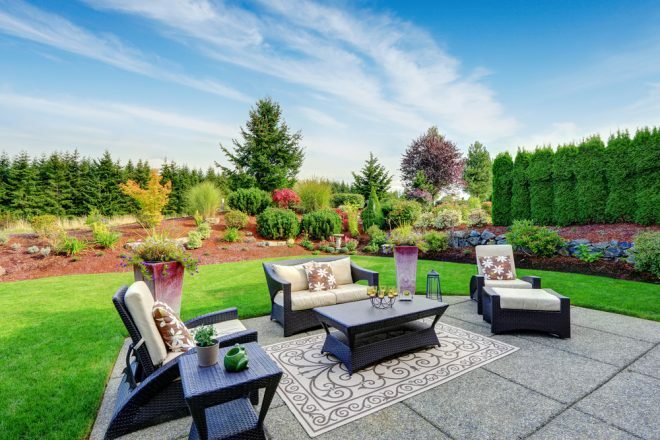 Your backyard is something you should never feel guilty about investing in. Just think about how much you use it, and the money you spend will always pay off not only in usage but in how much you get for your property when it comes time for it to go on the market.